Ready for retro cool? Back in the day, parfaits were the “company” dessert. And why not? They look fancy, taste great, and are easy to make. Best of all, you can serve them straight from the fridge, so they make the perfect end to a summer meal. No need to worry about dessert for your next dinner party. Just chill out. “Parfait” is French for “perfect.” Which this dessert is, in the summer heat. In France, cooks often make parfaits with a custard-like mixture of cooked cream, eggs, and sugar. 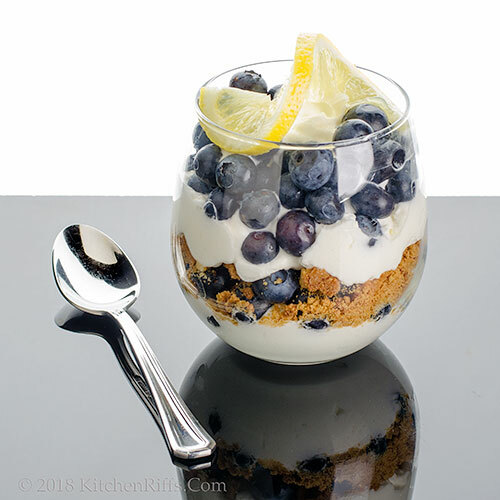 In the US, parfaits are usually a simpler, no-cook preparation. They typically feature layers of fruit, whipped cream or ice cream, and something crunchy like crumbled cookies, nuts, or granola. They resemble a trifle or fool (see our recipe for a Fruit Fool here). We’re going with whipped cream, which we flavor with lemon. That creates the perfect (parfait?) background for blueberries, which get along famously with lemons. Mrs. Kitchen Riffs is the dessert maven in our household, and this recipe is her creation. Prep time for this dish is about 20 minutes. You can prepare the individual parfaits ahead of time, or assemble them right before serving. (The latter option is our preference – and it’s a necessity if you use ice cream). Assembly time is about 5 minutes. This recipe yields 4 servings. You won’t have leftovers, but any spare bits will keep for about a day if refrigerated in an airtight container. Crumble the ginger snaps into a bowl or grind them in a mini food processor. (We like to use a mix of ground and crumbled.) Set aside. In a stand mixer, or in a large bowl using a hand mixer, begin whipping the cream. Once the cream has begun to form soft peaks, gradually add the lemon juice and zest, the lemon extract (if using), the granulated sugar, and the vanilla extract. Whip briefly, then taste. Adjust the amount of lemon juice and/or sugar if necessary. Continue whipping until the cream forms stiff peaks (but don’t overwhip). Layer the ingredients into serving glasses: You can use one or more layers of each ingredient. 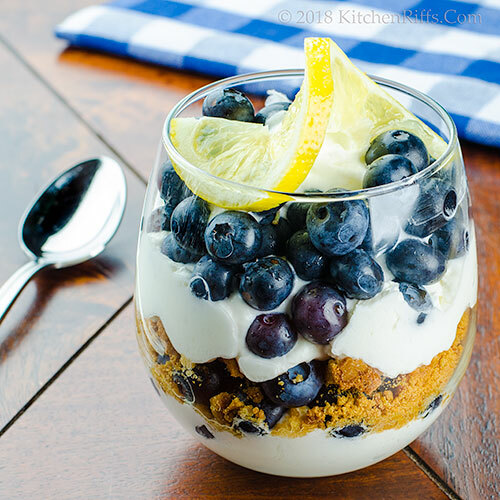 For the pictures in this post, we started by spooning an inch or so of whipped cream into each serving glass, then added a mixed layer of blueberries and ginger snaps. Then we spooned in another layer of whipped cream, and topped it all off with more blueberries. You can garnish each glass with a lemon twist, if desired. Then serve and enjoy! You can use homemade ginger snaps if you have them on hand. Otherwise, packaged ones work fine. One or two lemons? That depends on your taste. We like to use the zest and juice from two – because we like fairly intense lemon flavor. If you prefer something a bit more understated, use just one. Same thing with the lemon extract. It enhances the lemon flavor, which you may or may not like. Be sure to adjust the amount of sugar to your taste. Eight tablespoons will yield a flavor that’s sweetish, but not too sweet. You may prefer to go with more sugar, especially if you use 2 lemons. Don’t feel like whipping cream? You can substitute ice cream if you prefer. Or maybe sorbet (we haven’t tried that, but it sounds like a fun idea). If you use ice cream, you could of course top the whole deal off with whipped cream. Or top the dessert with liqueur. Instead of whipped or ice cream, you could use yogurt. If you serve that with granola and fruit, it sounds like breakfast to us (a breakfast with about as many calories as dessert – not that there’s anything wrong with that). We really like the taste of ginger snaps in this dish. But you could substitute nuts, such as toasted walnuts or pecans. Or use another type of cookie. Or granola. Blueberries are our favorite in this dish, but any fruit works. Bottom-line: This is a dessert you can play with. If something sounds good to you, it probably will be. That’s my Mrs K R. She keeps a cool head. What a beautiful and delicious summer dessert! Love the easiness of preparation too. This is such a perfect parfait! Or should I say it's a "parfait" parfait? 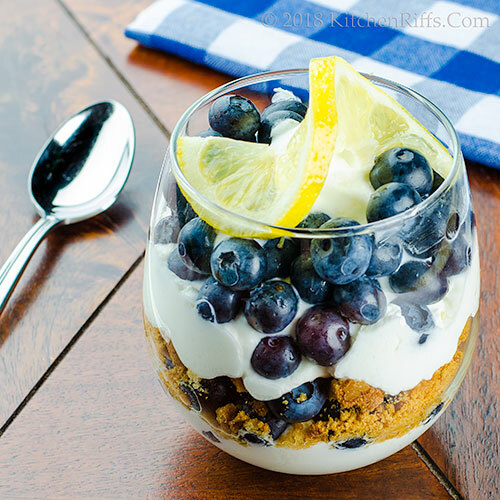 I love blueberries and lemon together so I need to try this! Hi Angie, easy is good, isn't it? Particularly when it also tastes good! Thanks for the comment. Hi Kelsie, we can NEVER resist blueberries and lemon. Never. :-) Thanks for the comment. Well look who is also into orgasmic blueberries this week :-D Your dessert, or the Ms I should say, is just parfait! Love the ginger snaps. Great no bake also for never ending heat wave. Hi Evelyne, your post was really funny! And this is really good. Blueberry season is so wonderful, isn't it? :-) Thanks for the comment. Easy, beautiful, delicious... you are so right, Angie. I think this recipe has it all. Hi Mae, it DOES have it all. :-) Thanks for the comment. Oh my goodness. Now I just have to find a recipe for keto gingersnaps. I know there is one out there and I am just a few steps away from a heavenly dessert! Hi Anne, you'll love this! And you can always substitute something else crunchy for the cookies. :-) Thanks for the comment. A perfect summer dessert. I love the use of gingersnaps. Hi Pam, gingersnaps are good! As is this dessert. :-) Thanks for the comment. How have I gone my whole life and not known that Parfait meant perfect in French!? In any case, this recipe is beautiful and yes, lovely for summertime! Hi Valentina, this is the perfect summer dessert, oui? :-) Thanks for the comment. Hi Bobbi, easy does it, yes? :-) Thanks for the comment. Hi Tricia, all the flavors really work so nicely in this -- it's good stuff. :-) Thanks for the comment. So parfait these parfaits are! Love this flavor combo and the photos want to make me reach in and grab one! Hi Abbe, these were FUN to photograph. :-) Thanks for the comment. this sounds so delicious and easy. i love your photos too especially the second last one. Black is beautiful:) Clever Mrs KR! Boy I'm I ready for "cool", retro or not. It's scorching hot over this way and that dessert is cooling me off just looking at it. I love parfaits and do remember them a many a dinner party or business dinner. Thanks for reminding me of this “parfaitly lovely dessert. 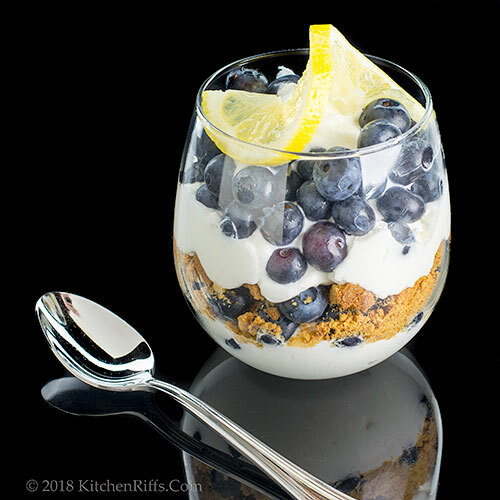 I love blueberries … and they go so perfectly with lemon and with vanilla! I don't usually use the two together … it's usually an either/or thing for me, but now that I'm writing this, I don't know why! I'm going to try both. The ginger snaps seem genius. Hi Sherry, aren't those black acrylic photos fun! Love shooting them! Thanks for the comment. Hi Ron, parfaits ARE parfait, aren't they? :-) Thanks for the comment. Hi Jeff, the ginger snaps adds some, well, snap to this dish. :-) And blueberry and lemon is THE BEST flavor combo. Well, one of them. :-) Thanks for the comment. My type of recipe in this hot summer! Hi Denise, this one will cool you down! Thanks for the comment. Hi Natalia, this is wonderful, isn't it? :-) Thanks for the comment. Blueberries for the Mr, two lemons for me! What more could a dessert offer? Just fabulous John! Hi Deb, it's really a wonderful dessert. And two lemons is a must! Thanks for the comment. I am always looking for recipes using lemons because I have 4 lemon trees in my yard. What an easy and delicious dessert. I love it. Hi Gerlinde, lucky you with those lemon trees! Thanks for the comment. Parfaits are such a wonderful summertime treat!! We've been having them for breakfast, lunch and dessert. I love the use of the ginger snaps. Never snapped to using those. :) What a lovely flavor with the blueberries. Thanks for the idea John! Your parfait looks awesome! Hi MJ, you'll have to snap to using ginger snaps. :D Parfaits are wonderful any time of the day, aren't they? Thanks for the comment. Hi Greg, parfait is as parfait does. :-) Thanks for the comment. Hi Ashley, don't you just love the blueberry/lemon combo? So good! Thanks for such a kind comment. John, you and I are on the same wavelength this week! I wrote a blog post (that will probably show up in a month or two) for a lemon cream blueberry cake. All the same ingredients, just slightly rearranged! I love that you’re bringing back the parfait… It’s such a great idea, so simple, and nic John, you and I are on the same wavelength this week! I wrote a blog post (that will probably show up in a month or two) for a lemon cream blueberry cake. All the same ingredients, just slightly rearranged! I love that you’re bringing back the parfait… It’s such a great idea, so simple, and with an old world elegance. Have a great weekend! Hi David, parfaits are wonderful, aren't they? LOVE the blueberry/lemon combo -- can't wait to see your cake. :-) Thanks for the comment. Hi John, for some reason I couldn't post a comment so am replying to yours here. I actually wasn't sure this was your post. I'm not use to seeing you post a dessert but I love this. I like the use of gingersnaps something I rarely use but how perfect in this light and refreshing summer treat. Great recipe! Hi Vicki, odd that you couldn't comment. Wonder if something is up with Blogger -- someone else mentioned they had the same problem recently. Anyway, isn't this a neat dish? Really good. :-) Thanks for the comment. Hi GiGi, LOL re Shrek. Love how you mind works. And although I know you can't eat this, you should make it for Landon -- he'd love it. ;-) Thanks for the comment. Kudos to Mrs KR for this lovely dessert! I'd actually cut the sugar in half if making it for just my husband and myself because we love tart lemon (our lemonade will make you pucker!). I do a yogurt/granola/berry thing that looks similar, but this would be such a treat for dessert--whipped cream doesn't scare me! Hi Jean, my lemonade is lemon juice and water -- no sugar. You'd love it! But I always add sugar if I'm serving it to someone else. :-) Thanks for the comment. First, woo hoo I could leave a comment!!! :) Next, I love an easy summer dessert like this. Homemade ginger snaps sound pretty awesome in it. Hi Laura, glad you got through! Isn't this nice? SO GOOD! :-) Thanks for the comment. This looks divine, the perfect (parfait) Summer refreshing dessert. Thanks for sharing Mrs. Kitchen Riffs awesome creation. Hi Amira, divine is exactly the word for this. :-) Thanks for the comment. Hi Carolyn, such a great dish, isn't it? Love it with these flavors! Thanks for the comment. I love the idea of using gingersnaps in a parfait! So delicious with blueberries and lemon. What an easy summer treat! Hi Liz, really easy, really tasty. :-) Thanks for the comment. Hi Debra, lemon tastes wonderful, doesn't it? And really terrific with blueberries! Thanks for the comment. Hi Frank, bet I know where some of those blueberries are going. :-) Thanks for the comment. Hi Pam, delighted to hear you're blogging again! And yes, you need to try this -- good stuff. :-) Thanks for the comment. Beautiful. And I imagine you could really change up the cookies and the fruit. So great for a dinner party since these can be made ahead of time. My kind of dinner party food! Hi Mimi, we change up the fruit and the cookie all the time when we make these. They're fun to play with! Thanks for the comment. John, this is definitely my kind of dessert (although I would probably eat it for breakfast too!!) Crushed ginger snaps are my first pick over graham crackers for many varieties of no-bake desserts too. :) Stunning pictures as always! Hi Marcelle, this makes a wonderful breakfast. :-) Thanks for the comment. Hi Anne, lemon and blueberries just work together in terms of flavor, don't they? Love that combo! Thanks for the comment. What an easy way to whip up some parfait! I can have it anytime of the day :). I love blueberry and citrus combo so much, they go so well together, right? Hi Shibi, it's a terrific combo! Great way to get my blueberry and lemon fix. :-) Thanks for the comment. Hi Emma, love the lemon/blueberry combo. So good! Thanks for the comment. Hi Liz, so nice to hear from you! We're doing quite well, hope you are too. And you should give this a try -- good stuff. :-) Thanks for the comment.